Sometimes, the quality of services we are provided with is lower than we expected. In this case, we can either write a letter of complaint, or request a refund, if a sum of money has been spent. However, you cannot just write, “Give me a refund for bad service” to a company that has disappointed you; knowing how to write a refund letter properly can significantly increase chances that your inquiry will be satisfied. Figure out the exact addressee of your letter. Simply sending a refund letter to a “Company that I am Dissatisfied with” will have less chances to be processed and taken into consideration. For more information, you can call the company and ask them whom exactly you should address your refund letter to; sometimes, this information is available on a company’s website. Collect your receipts, bills, purchase orders, and other documents that can serve as supporting evidence to the fact of you making a purchase or using a certain service. Make copies of these documents. You will need to send these copies to your addressee. Start writing a letter that explains the circumstances of your purchase (or use of a service). Explain what exactly you are dissatisfied with, what went wrong, and so on. In the next paragraph, make your request. Formulate your request thoroughly, because if your addressee will agree on a refund, you will get exactly what you asked for. Establish a timeline that demonstrates when you expect a solution to your problem. 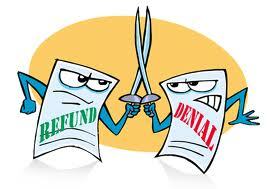 Reread, proofread, and edit your refund letter, since it needs to be accurate and free from technical errors. No matter how disappointed you are, a letter still remains a letter, which means you cannot write it your own way, but should observe the existing formatting and etiquette requirements. The sooner you write your refund letter, the higher the chances are that your refund request will be satisfied. The longer you wait, the stronger the impression will be that you have made the maximum use of provided goods/services, and then decided to get your money back. Make a copy of the letter and all supporting documents; this might be needed when you will be finalizing the agreement. Depending on a company’s size, time needed to process your request may vary. Usually, bigger companies take more time to process your request, because they have more departments than small companies. Make yourself acquainted with the company’s refund policy before submitting a letter; your case may not be in the list of covered issues. Keep your language plain and clear. Your addressee won’t enjoy having to read through literary pioneering. Thank your addressee. Politeness can never be superfluous. Use “yelling” language. Also, avoid writing in capital letters, being rude, and showing your disrespect in other ways. Wait until the last moment to submit your refund letter. The sooner you send it, the better. Ask for compensation that is not reasonable. Send your refund letter just to a company, instead of its specific department (or person) responsible for processing refund requests. – Forgetting to provide your addressee with a copy of paychecks, bills, receipts, and other documents. – Not observing formatting and etiquette rules. – Submitting a refund letter after a lengthy period of time, and asking for unrealistic compensations.